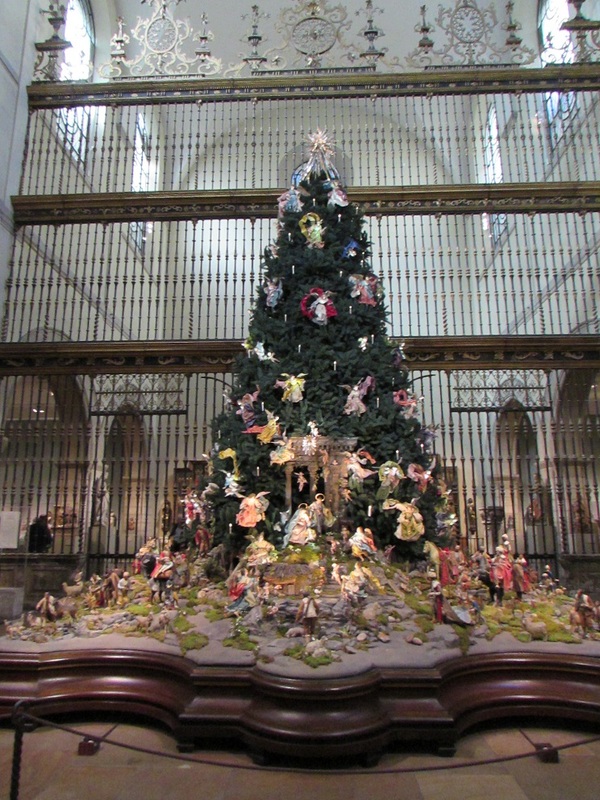 “The only thing I must see is the tree at the Metropolitan,” said traveling companion Patricia, when we discussed what we would be doing during our Christmas season trip to New York City. The object of our visit was to see the musical Hamilton, the show about the first US Secretary of the Treasury that is currently the hottest ticket on Broadway. Besides that, I was on a Hamilton stalk, ready to see every NYC site associated with Alexander Hamilton. Patricia, on the other hand, was all about Christmas. Eventually, you’ll hear about our NYC history tour, but since today is Christmas, I’m going to show you Patricia’s half of the trip. 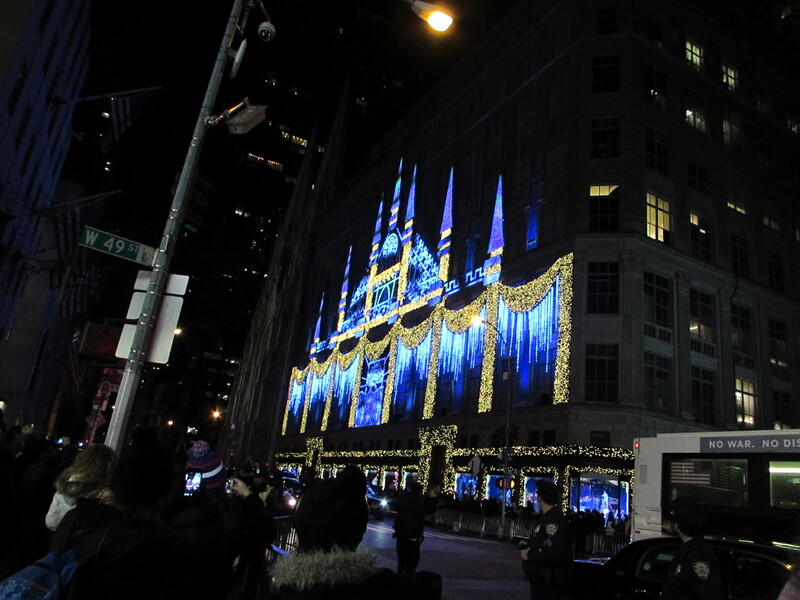 Because I really don’t think any US city does Christmas like NYC (that’s the facade of Saks 5th Avenue, below). “On the second floor,” the woman replied. We went upstairs. No sign of a tree. Really, it’s the biggest draw of the season at the Metropolitan. How could Information Lady #1 have gotten it wrong?! In any case, IL #2 got it right. 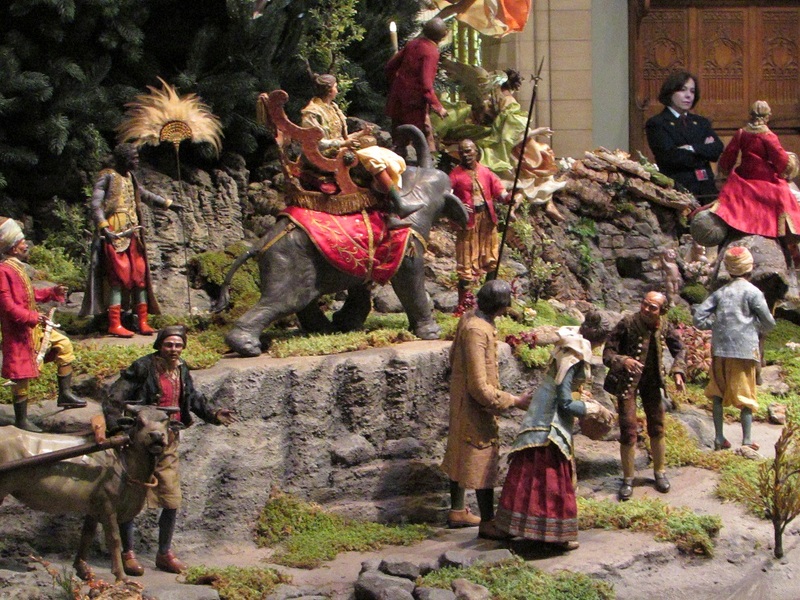 The Neapolitan baroque creche display is an annual tradition at the Metropolitan. The creche, made up of over 200 figures, sets the Nativity scene in 18th century Naples, with townspeople and animals, and exotically dressed Asian and African visitors. Along with the Nativity in Naples scenes, there are 50 18th century angels that hang on the tree. This year, the tree is a 20 foot blue spruce that stands in front of an 18th century choir screen from the Cathedral of Valladolid in Spain. To round off the ambiance, there’s recorded medieval Christmas music playing in the background. The display was collected by artist Loretta Hines Howard, in the early 20th century and donated to the museum in 1964. There was a kerfuffle last year when the museum told the family of Howard, who died in 1982, that they would no longer be allowed to arrange the display, as they had since the beginning. Frankly, I’m surprised that the museum allowed them such control for as long as they did. 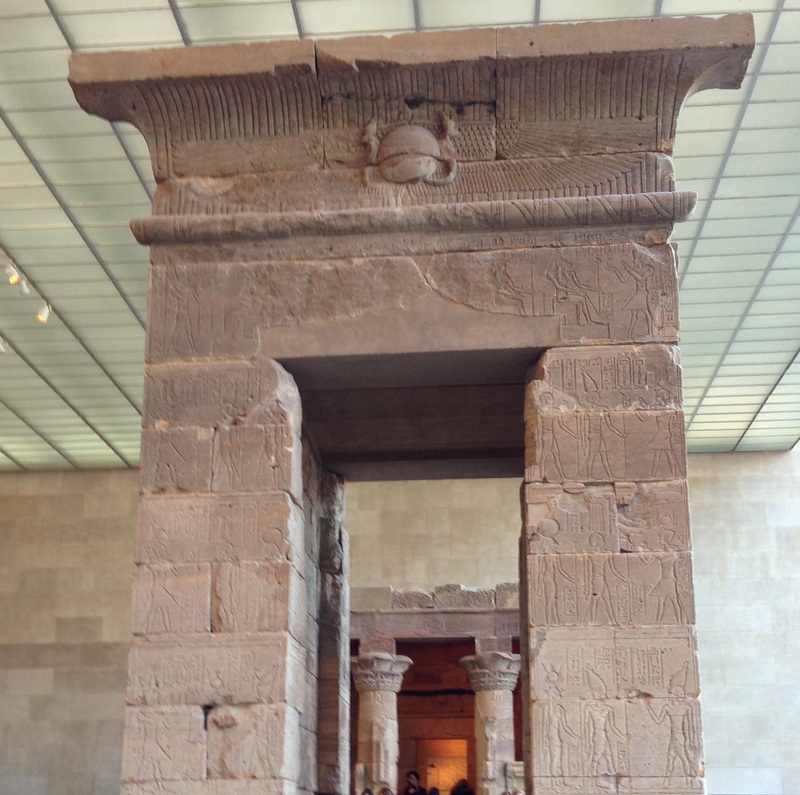 Let me show you one other marginally Christmas-related Metropolitan display: the Temple of Dendur. Built in Egypt during the reign of Caesar Augustus (that’s what makes it marginally Christmas-related: “There went out a decree from Caesar Augustus….”) and completed circa 10 BCE, it was threaten to be submerged under a lake with the building of the Aswan Dam. So it was dismantled and given to the US by Egypt in 1965, in thanks for the US role in saving other historic Egyptian buildings threatened by the dam. As Mr. History Tourist and I go off to Philadelphia to spend the day with our children and their families, we’re wishing all of you a safe and very merry Christmas. 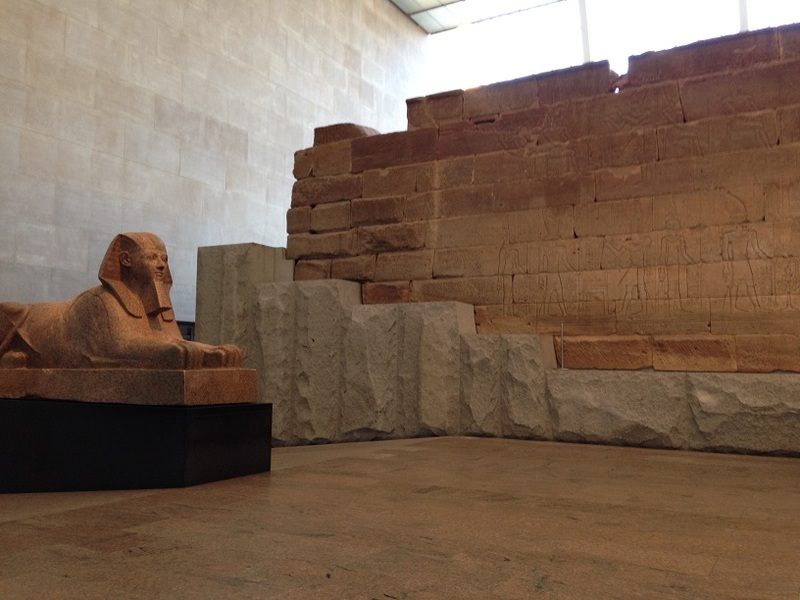 Gallery | This entry was posted in New York and tagged Metropolitan Museum of Art, Neapolitan Creche, Temple of Dendur. Bookmark the permalink. It was a wonderful weekend. Seeing the tree made me happy. It was amazing – the museum’s highlight. The tree was spectacular – it would have been worth going to NYC just to see that. But the rest of the city was all dressed up for Christmas and spectacular as well. We had an amazing Christmas. Hope yours was great and all the four legged ones got lots of treats. It was a good Christmas – pretty quiet. My mom had the flu Christmas Day and now my Dad has it, so I’m really hoping that Jon and I didn’t catch it! A couple of long walks with a friend, and some relaxing with the kitties are rounding out the weekend. I love Rococo angels! All the swirly fabric folds and gold just DO it for me. The angels were beautiful. The whole thing was just stunning. And they set it up in the medieval section of the museum, with medieval Christmas music. The entire effect was overwhelming. We’ll be seeing a lot of rococo in Italy next year!